Welcome to the Local Allotments! Would you like to grow your own vegetables, flowers, fruit and herbs? 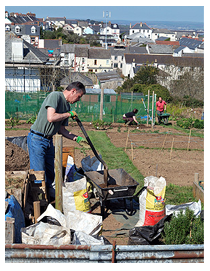 If so, it might be that you would like to take on the tenancy of an allotment in Bideford. We currently have approximately 160 allotments spread over 4 sites in Bideford, which can be let to Bideford parishoners. The Town Council now has 4 sites having in recent years secured the lease for a new allotment site at Handy Cross from the Bridge Trust. The site currently consists of 2 fields, which are just under 4 acres in size. One of the fields will be turned into approximately 30 plots and the second field will provide a parking area with room for a community project in the remainder of the field. The Bridge Trust has very generously leased the fields to the Town Council for a reduced rate in order to leave some funds available to prepare the fields. This site like the Marland site is run as a self managed group.